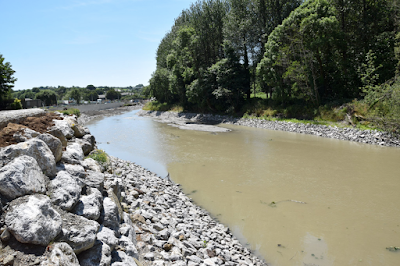 Pictured below are photos of Riprap (Rock Armouring) along the Bandon River and information gathered from the Department of Homeland Security website that explains the issues encountered on rivers that use Riprap as a solution. Put simply, riprap is the layering of rocks (angular rocks generally being preferred,) along a threatened area to counteract the constant wearing away of land brought about by repetitive hydrologic activity. Whenever waves or moving waters meet unprotected soil, there will always be ero- sion. Covering exposed soil with rock helps protect it from being washed away, securing an embankment against further erosion. 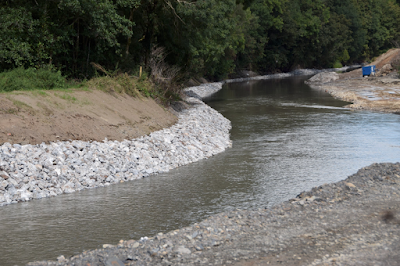 Problems arise because the effects of riprap do not stop at the point of installation. When positioned along a section of riverbank, for example, riprap has a number of negative impacts on the surrounding environ- ment. Riprap tends to increase the speed of water flow along an armored reach, as the water has no points of friction to come up against and nothing to slow it down. This additional strength of flow presents issues further downstream from a riprap protected bank, as water is deflected off the riprap and directed at other points of riverbank. The increased strength and speed of the water only increases erosion suffered at these new locations, the typical result of which is the necessity of installing additional armoring, which merely moves the problem further down the stream. Riprap impedes the natural functions of a riverbank or shoreline, as it interrupts the establishment of the riparian zone, or the point of interface between land and flowing water. A properly functioning riparian zone is important for a number of reasons; it can reduce stream energy and minimize erosion; filter pollutants from surface runoff via biofiltration; trap and hold sediments and woody debris, which assists in replenishing soils and actually rebuilding banks and shorelines; and it provides habitat diversity and an important source of aquatic nutrients. 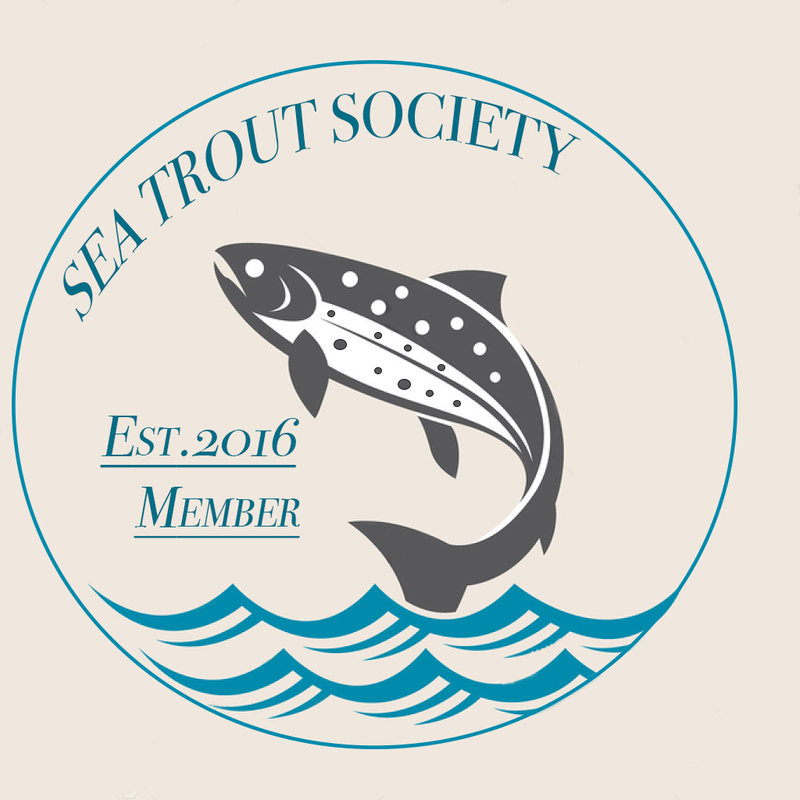 fish, especially in high-silt loca- tions, the installation of riprap leads to other, more significant, issues. When riprap is the primary or only form of riverbank stabilization measure, the end result is typically a uniform, smooth channel, with no complexity. This means that there are no areas of vegetation either in or overhanging the water, leaving fish at risk from predation. In ad- dition, a lack of riverbank diversity denies fish a place to seek refuge during periods of high-water, which often results in their being washed out of a fast moving system during flooding. Riprap causes other, albeit less sig- nificant, problems as well. 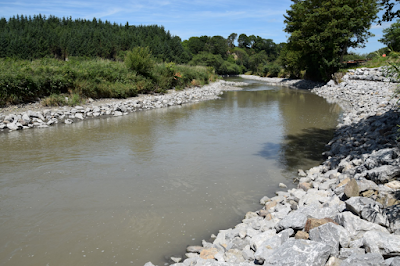 In areas of low vegetation, when exposed to direct sunlight, the rocks that com- prise riprap can reflect light into the water, which increases water temperatures to an unhealthy degree for fish. Riprap also tends to suffer from structural integrity issues during and after high-water events. 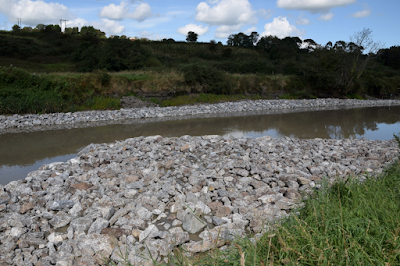 Losing rocks to high water or fast flows, a riprap structure will soon begin to fail in its purpose. 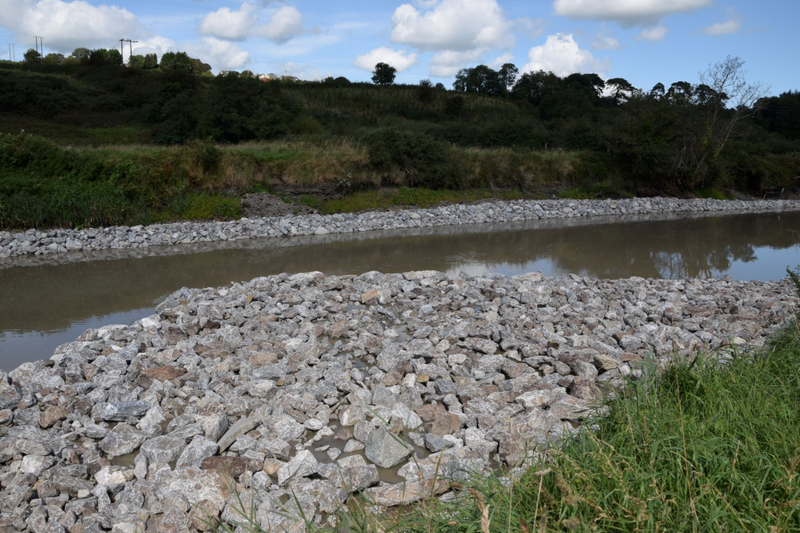 Once the soil that the riprap is designed to protect is exposed, the damage continues as before its installation. This possibility requires constant monitoring and maintenance, which ultimately becomes expensive and problematic. The OPW's response which read ‘the proposal to remove the weir could have delayed the completion of the flood relief scheme by years’ is just an insult to anyone’s intelligence. 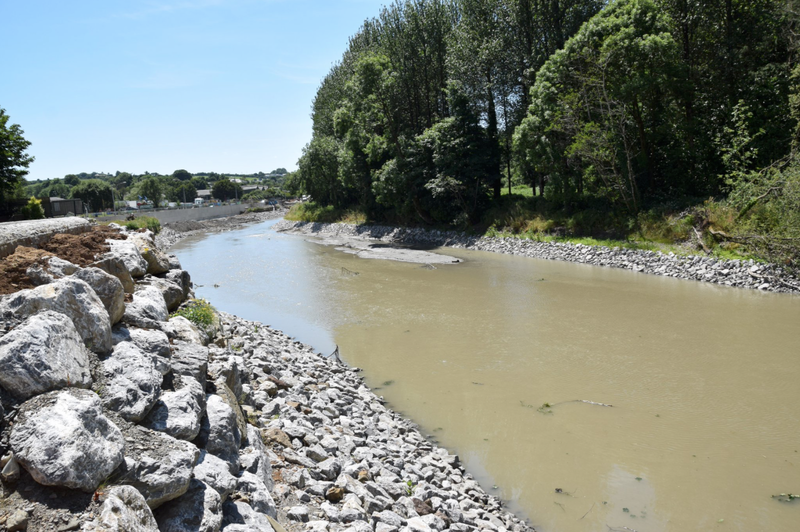 How could removing the weir take longer than removing half of it and then laboriously and extensively constructing a monstrous fish pass that better resembles a whale pass instead? I think the penny has dropped in many people’s minds about this whole project and questions need to be asked as to why the OPW decided to take the most expensive and environmentally-destructive route in rolling out the flood scheme. The river bed below Bandon is completely dead and devoid of all natural life. It has been noted by environmentalists that the rock armouring going all the way down the river stretch is completely over the top and severe, which will make any type of environmental recovery almost impossible. It’s almost like no EIS was ever done here as there have been no concessions to environmental protection, and no effective mitigation measures. How did it all come to this? Will the OPW ever change their ways?